Relief is on the way for users of Noe Courts. The park’s long-shuttered restrooms are about to be replaced, thanks to a $185 million bond measure passed by San Francisco voters nearly four years ago. Demolition of the Depression-era facilities is scheduled to start this spring, and with any luck, the new, wheelchair-accessible restrooms will be open by next Christmas. But that's not the only change in the works for the popular park on Douglass Street between 24th and Elizabeth. With the help of a $210,712 city grant, the grassy slope between the playground and the tennis and basketball courts will be transformed—with new landscaping, a terraced seating and picnic area, and improved drainage. The Hoffman Avenue resident explained that the Friends, which has about 150 people on its mailing list, went to the Neighborhood Parks Council (now part of the San Francisco Parks Alliance) early this year for ideas on how to fix up the park. They were encouraged to apply for a grant from the Community Opportunity Fund, a $5 million pool to help pay for small-scale park improvements established by the 2008 bond measure. 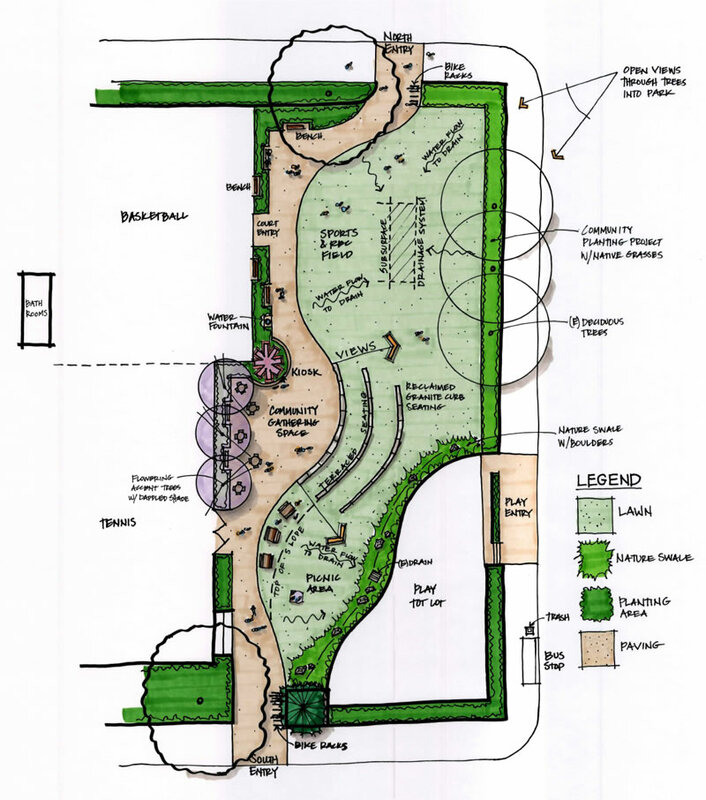 After attending applicant workshops with park department staff and receiving community input at a meeting May 31, co-chair Justine Sears prepared the grant application, complete with a site plan by Terra Ferma Landscapes of South San Francisco. The application was endorsed by District 8 Supervisor Scott Wiener, former Supervisor Bevan Dufty, the Neighborhood Parks Council, the Noe Valley Association, Friends of Noe Valley, and an array of neighborhood residents and business owners. Of 22 applications submitted, park department staff recommended that 10, including the two in Noe Valley, be funded. Grants, which ranged from $248,239 for a skate park in Balboa Park to $6,500 for a new gate and sign at Jose Coronado Playground in the Mission, totaled $1,326,848. Unsuccessful applicants may try again next year. What comes next? Community Opportunity Fund project manager Jacob Gilchrist said department staff will be meeting with representatives of the Friends and the Parks Alliance in early December “to develop the overall project schedules, then begin detailed design.” All improvements must be completed within two years, he said. Norman said that unlike four years ago, when the Friends raised $17,000 to help pay for a new playground, they are not required to contribute cash this time. But in-kind donations are welcome. She said she was especially pleased to hear about the new restrooms. “So many people use the park, particularly families with young children. It’s really hard for kids who are being toilet-trained. Should you make them wear a diaper because there’s no place to go at the park?” asked Norman, who has a 9-year-old son and a 7-year-old daughter. She said she also looks forward to the new seating and picnic tables. To contact Friends of Noe Courts, email noecourts@gmail.com.